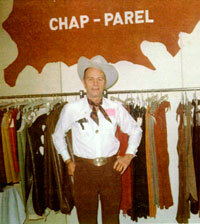 Chap-Parel is no longer in business after the passing of it's founder, Gerald Roberts. 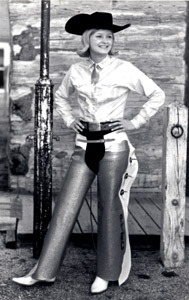 For Rodeo Chaps, please see www.circlerchaps.com (or call 785-263-4502) for high quality rodeo chaps and custom chaps for youth and adult. 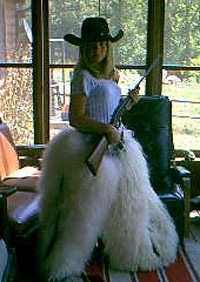 Circle R Chaps, located in Abilene, Kansas, is run by a close friend of the Roberts' family who worked for and learned the chap making trade from Gerald himself. 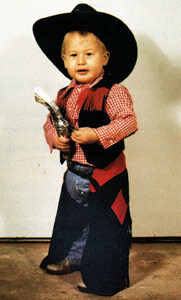 For Western Wear & Gear, please see www.robertscowboyshop.com in Abilene, Salina and Manhattan, Kansas. Chap-Parel: Gerald's rodeo chap manufacturing shop in Abilene, Kansas. 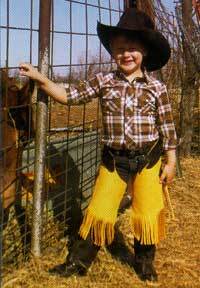 Gerald custom-made rodeo chaps, working chaps and show chaps and other rodeo gear, such as rope bags and gear bags. 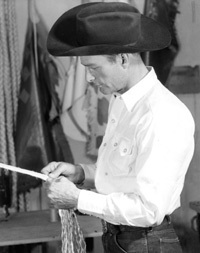 Gerald invented the 9-plait bull rope still used by cowboys today. 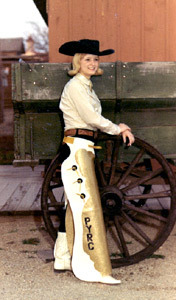 Gerald designed, hand cut and made many styles of rodeo chaps. These are just a few. Designed to honor Gerald's brother Ken - Bull Riding Champion 1943, 1944 & 1945. The motif is Casey on Neck Tie. Gerald at the Denver market. 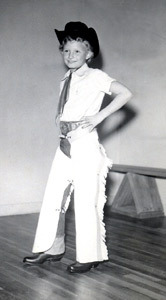 Since Chap-Parel's beginning, children and grandchildren have served as models for the Chap-Parel brand rodeo chaps and have been featured in the various catalogs.